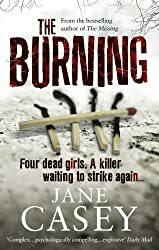 The Burning by Jane Casey is one of the books I selected for the TBR Pile Challenge 2015. It’s a book that I read about on other book blogs and thought I would like. I was right – I really enjoyed it. It’s the first the DC Maeve Kerrigan series. Maeve is on the murder task force investigating the case of the serial killer the media call The Burning Man. Four young women have been brutally murdered, beaten to death and their bodies burnt in secluded areas of London’s parks. When a fifth body is discovered that of Rebecca Haworth, it appears to be the work of The Burning Man – but is it, there are slight differences? The more that Maeve and her colleague Rob Langton check out the facts it appears it could be a copy-cat killing. The pace of the book is quite slow at first as the characters are introduced and the story unfolds mainly through Maeve’s eyes with some chapters narrated by Rebecca’s friend Louise, and briefly by Rob. Because the pace is slow to begin with the main characters are fully rounded – Maeve in particular is a likeable character, intelligent and empathetic, working to impress her male colleagues and determined to catch the murderer. She’s new to the job, which both her boyfriend and her family criticises. Rebecca’s character is revealed through Louise’s eyes, fleshed out as other friends give their versions of her past to Maeve and Rob. As the pace picks up, a complex plot develops providing several suspects which kept me turning the pages right to the end. I have the third Maeve Kerrigan book, The Last Girl, but I think I’ll postpone reading it until I’ve read the second book, The Reckoning. There are now six books in the series and Maeve has her own website! As well as the TBR Pile Challenge The Burning completes one of the categories in the What’s In a Name challenge, that of a book title containg a word ending in ‘ing’, the My Kind of Mystery challenge and also the Mount TBR Reading Challenge (a book I’ve owned prior to 1 January 2015). @MargaretFreeman thank you for reading it and for the lovely review! I really like Maeve and also enjoy getting to know her family, friends, coworkers, etc. For me, that is a big plus in mysteries. A series I’ve not heard of and this first one sounds interesting so I’ll keep an eye out for it at the library. I’ve also got Jane Casey on my TBR pile, as so many fellow crime fiction fans have raved about her. Look forward to starting and comparing notes. Margaret – Oh, I enjoyed this one very much, too. I think you’re right too about the pacing and about the way the characters are developed. I prefer my police procedurals to have some solid, rounded characters like that, so like you, I liked that aspect of it. I am currently reading ‘The Reckoning’ because I read ‘The Burning’ awhile back, after someone mentioned it on Goodreads. This book also has great character development and a good storyline. I’m planning on reading all the Maeve series eventually, and hopefully the series will be continued! Good job, Jane Casey! This series sounds like one I’d like. I’ve just started S. J. Bolton’s series, also featuring a female detective in London. Seems like I can’t get enough! Sounds like an interesting read, and one that I’d enjoy. I’ll have to add it to my TBR pile. Thanks for the review!